No Man's Sky fans can't can't exactly play with each other, but they still want to come together to celebrate their communities. Somehow, a new player-created holiday became a story about conflict, betrayal and the disappearance of an entire civilisation. No Man's Sky players have created their own civilisations with their own cultures and governments, many of which come together in the Federation. You can think of it as a space UN, where they discuss plans to expand into different sections of space. To celebrate a year of accomplishments, the Federation will soon be celebrating a holiday in-game, called Unification Day, which was created with the intention of bringing each of the civilisations in the Federation together. 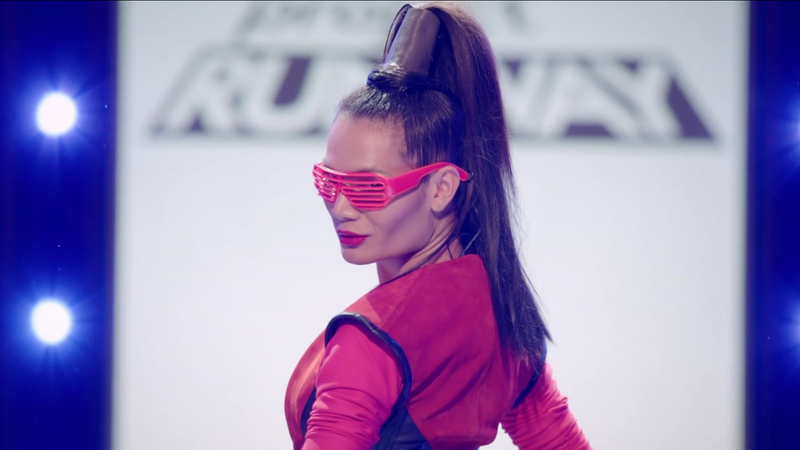 During this event, players will compete in drag races, sculpture contests, and scavenger hunts. Players considered this to be a shout-out, because it uses words like "federation," and "hub," which seem like references to fan-created groups known as the Galactic Hub and the United Federation of Travellers. So, they decided to make "Unification Day" real. 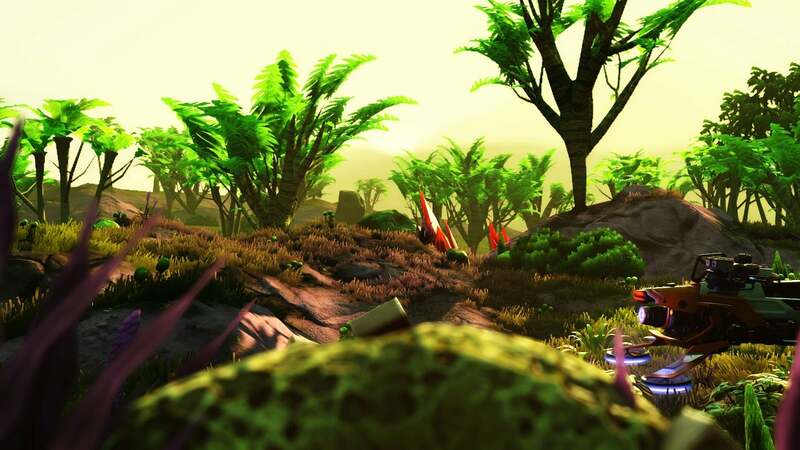 The first player to suggest organising an event for the Federation were Galactic_Glory from the Vestroga Hub and NMS_Survival_Guru from the Amino Hub. Both of these players acted as ambassadors from their respective civilisations to the Federation, meaning that they got to vote on long term projects involving the larger community. Being in the Federation comes with a few perks, among them is assistance from other, larger civilisations for establishing travel routes between different star systems, planning and organising events, and collaborating to colonise space. At the time, there were tensions between the Amino Hub and the Galactic Hub. It revolved around the organisation and support of an in-game Olympics where players would compete in a series events, like relay races and sentinel destroying competitions. 7101334 promoted the Olympics to the civilisation he runs, The Galactic Hub, noting that some of the events were less accessible than others. Sodacon, an ambassador from the Amino Hub, took this as a dig at the Olympics. Over private messages, 7101334 that wasn't his intention at all, but after an unpleasant conversation with the Amino Hub ambassador, he ended up boycotting the event anyway. While this strife unfolded, Amino Hub ambassador NMS_Survival_Guru saw opportunity for chaos. In private messages, he told me that he wanted to continue pushing the tensions between the Galactic Hub and the Amino Hub, and that Unification Day was a perfect opportunity to do so. 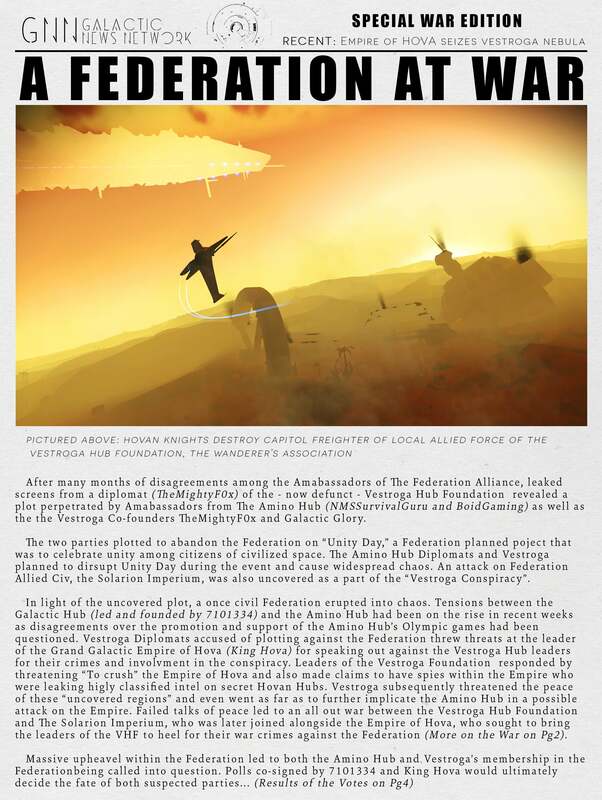 Vestroga has already started an alliance with the Amino Hub, so NMS_Survival_Guru reached out to Galactic_Glory and together they started plotting out ways to disrupt Unification Day. He said that he had thought it would be "great publicity," for peace talks between the Amino Hub and the Galactic Hub to break down, preferably over a live broadcast during Unification Day. He wanted to cause commotion for the Federation, seemingly just for the sake of making things chaotic. "I love a good conspiracy," NMS_Survival_Guru said to Galactic_Glory in a private chatroom. Even more damningly, Galactic_Glory made veiled threats to "crash the party," at Unification Day with members of the Amino Hub. Galactic_Glory also threatened another civilisation, the Empire of Hov, saying that Vestroga and the Amino Hub would "crush" them. Using these communications as evidence of malintent, 7101334 put it to vote within the Federation that the Amino Hub and the Vestroga Hub be removed from the group, and thus locked out of the perks of being in the Federation. The Vestroga Hub was voted out, and while the Amino Hub stayed in the Federation, NMS_Survival_Guru would end up resigning as ambassador, taking the blame for the unpleasant proceedings. "Peace is boring. Games do well when there is something to do besides wander and stare, [like] an antagonist or some strife." Although the Amino Hub would survive one of their ambassador's machinations relatively unscathed, the same was not true for the Vestroga Hub. After they were removed from the Federation, the Empire of Hova launched an invasion on them. The Empire of Hova is a roleplay heavy civilisation and the Empire itself takes on an aggressive, militaristic role. As a response to these threats, they launched an offensive against the Vestroga Hub that would destroy the civilisation entirely. In a game without any multiplayer, it's hard to what a war between two player driven civilisations would even look like. For Gtahov, he and the Empire of Hova brainstormed ways to drive Vestroga out of their quadrant of space. Unlike most civilisations, Vestroga was named after the star cluster they inhabited. If Hova could make that part of space difficult, or even impossible, for them to colonize, it would probably be the end of Vestroga. "When we invaded we targeted the Vestroga Nebula and took as many systems in the region as possible," Gtahov said. "We also entered their already claimed systems and claimed all the undiscovered planets and moons as well". 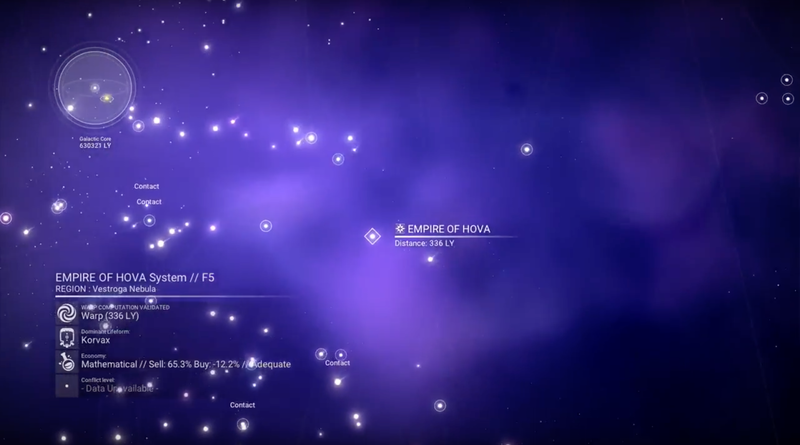 Players in the Vestroga Hub would find that the majority of moons and planets were not only discovered, but named antagonistic things like "Vestroga Falls," or "Demise of the VHF," or "Hova's Victory," or simply "Empire of Hova." Many of the surrounding planets and stars share this name. "Having a ton of these systems filling up the Galactic Map Screen makes it immensely more difficult to map and navigate a region," Gtahov said. While planets have coordinates, it's much easier to understand the space around you using landmarks the community decides upon. If all the planets around you are named the same thing, finding those landmarks is like looking for a needle in a haystack. Not only could players in the Vestroga Hub not expand to new planets or navigate space, every named planet they could see was rubbing it in. Players from Hova would also block Vestroga players access to their communal farms, which are located at public bases that are accessible to all players. If you claim a base and it's publicly accessible, any visiting player can reap the benefits of a farm growing a valuable plant there. Gtahov says the process of blocking access to a farm is called "placing an embargo" on it. "What we would do is have 2 or 3 players go to the planet where a farm is and have them claim a different habitable base throughout the day so this ensured no one could get to the farm," Gtahov said. No Man's Sky only allows for one base per system, meaning that while you may be able to see your own base, only the most recently made base in a given system will be visible to other players. In most civilisations, there are rules against building bases in systems that already have one because of community farms, which are located at these bases. "There are ways to overwrite a new player's base if they come into your system," Gtahov said, "but since we were constantly establishing a new base it meant the original base was always being overwritten." On November 27th, after a day of war, the Vestroga hub disbanded, leaving the star system they previously inhabited. As far as why, Gtahov said that "having the entire region now claimed under the Empire of Hova's banner left them little choice but to pack up and leave." No matter the reason, Vestroga folded quickly to the Empire of Hova's offensive. Gtahov is conflicted about having started the first in-game war. "While on the one hand it's really cool to be a part of NMS history and an inspiration to a lot of players, on the other hand I realise it opens the door for a much different kind of community interaction," he said. "I think these kind of events can be great for the NMS community as long as they are done with respect and good intentions. Now that people see how civs can invade other civs there's a good chance we will see more of it, but hopefully with the Federation in place we can come together to see war as a method of deterrent rather than a tool of destruction." Other players see conflict as a fun new feature of a game they already love. Nevadander, ambassador from Deep Thought Collective, gave me an in character and out of character answer when I asked him about the war. In character, he lamented the savagery of intergalactic politics. Out of character, he said, "this is all great." "Peace is boring, he said. "Games do well when there is something to do besides wander and stare, [like] an antagonist or some strife." War wrapped up on December 3rd. It just so happened that Unification Day was around the corner, set to start on December 30th. While the war was a big event for players, it only had a direct impact on a few civilisations, and Unification Day became a more pressing matter. 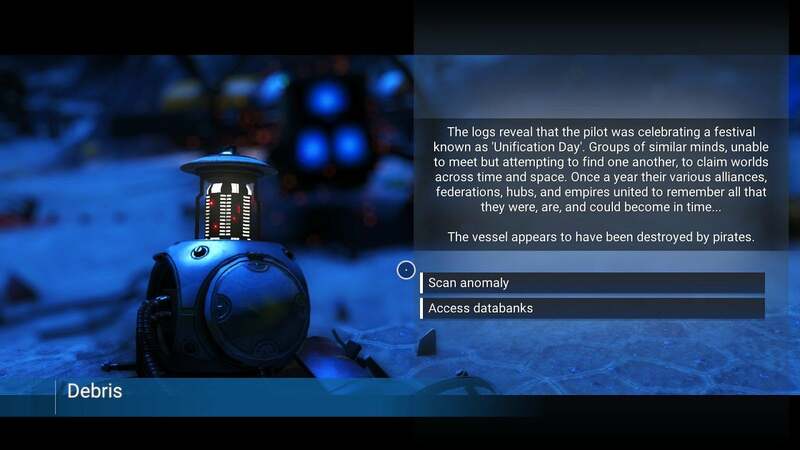 Even NMS_Survival_Guru said that he would attend the Unification Day celebration "without any drama." "I think it just makes Unification Day more relevant, if anything," 7101334 said of the war and the dissolution of Vestroga. 7101334 is particularly excited for the drag races, and especially the sculpture contest. "People used to sculpt Gold and Emeril deposits all the time," he said, "so I think this will be an interesting new incarnation of that old NMS tradition." Today, players are announcing their arrival at the planet where the Unification Day celebration will happen next week. It's an orange-y, grassy planet, where snakes fly through the skies. The players there are leaving messages wishing other players a happy Unification Day. "Hello from Idaho," one says. "Be excellent to each other," says another. Even Greg Buchanon, the writer who penned the lore that inspired these players, tweeted in support of the in-game holiday. While these messages may still be here for the next Unification Day, the Vestroga Hub won't be. Unification Day will also always mark the anniversary of No Man's Sky's first war, and of the end of a civilisation. The player-created event now matches Buchanon's lore, which was a distress beacon from a ship that was ravaged by pirates, their festivities ending in ruin. If I'm reading this right, No Man's Sky still has no actual multiplayer... So the players are what, basically playing Fantasy Football drafting solar systems into their teams/federations? And I suppose more accurately given the 'conflict' it would be Fantasy EVE. You can visit other peoples bases and at best leave a message thing, if they are there you will see a floating ball of energy traveling around. Less of a war and more a passive aggressive fight. I thought this stuff was kinda cool in the beginning, but the effort has long surpassed the game itself.